Lower temperatures in winter, coupled with metabolic deficiencies can result into fruits which are less sweet Specific hormones and biochemicals can accelerate the metabolism at harvest. 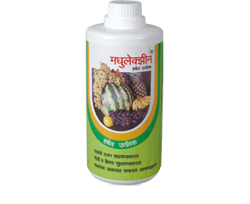 “Madhulexin” contains Such hormones and biochemicals which increase sugar percentage in fruits reduce the fruit of berry drop improve the colour and lustre of the skin & cause increase in yield Madhulexin spray is particularly useful in Grapes, Mosambi, Pommogranates, Papaya, Mango, Sapota, Figs, Apple and Tomato. First Spray: First spray should be given one month before estimated harvesting date. First spray is generally recommended at the beginning of fruit maturing.